The Welsh Government says NHS staff in Wales will get a pay offer but accuses the UK Health Secretary of telling a "straight lie". Health Secretary Vaughan Gething says the money will be targeted to improve waiting times for elective surgery, diagnostics and therapies. Doctors and nurses have been ordered to pay almost £70,000 in a row about parking tickets at their busy NHS hospital. The Welsh Government has announced £3.4m in funding for the academy which will be based in Bridgend. The money will be used to provide new equipment, such as MRI, CT and cardiac scanning machines. 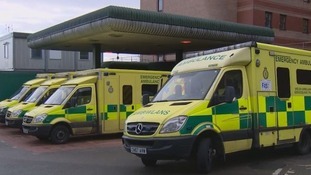 The ambulance service is to receive a cash injection of £11m, the Welsh Government has announced. The organisation which commissions emergency ambulances will receive £8m of extra funding this financial year. The money will also help purchase 17 new emergency ambulances at a cost of £3m to add to the 243 fleet in Wales. It's come from the £40m of 'winter pressures' money given to the NHS earlier this month. The new chief ambulance services commissioner for Wales Stephen Harrhy said the money will not only help improve response times but help 'deliver an improved clinical service'. "Improving the performance of the emergency ambulance service is a priority for the Welsh Government. This multi-million pound investment is proof of that commitment. "It will increase the number of frontline emergency ambulances available across Wales. The Emergency Ambulance Services Committee has also invested £7.5m to allow the ambulance service to employ 120 additional paramedics." The Welsh Government has welcomed today's report by the Wales Audit Office which shows the NHS isn't delivering low waiting times for patients having elective surgery. A spokesperson said there's good practice underway across Wales and waiting times for patients has been falling since last year. "We welcome the Wales Audit Office's report, which recognises the good practice underway across Wales, the prudent healthcare agenda and our planned care programme, which will set and deliver good practice across the country. "The report shows nine out of 10 patients are waiting less than 26 weeks and the median wait is just under 10 weeks. Waiting times for diagnostic tests have also been cut, with the number of patients waiting more than eight weeks falling by 24% since May 2014. "We expect health boards to continue to improve performance against referral to treatment times targets; this will be outlined in their integrated medium term plans, which will be submitted at the end of this month." This is an important day – and an important judgement – for service reconfiguration in Wales. Health services need to evolve and modernise to meet the changing needs of the population and take full advantage of the benefits of new technology and advances in clinical skills.